(WACO) – Representatives of Indianapolis-based Republic Airline visited Texas State Technical College on Wednesday afternoon to talk to aviation students about careers. The airline, like others in the United States, needs qualified pilots. The number of airline and commercial pilots is expected to grow to more than 129,000 through 2026, according to the U.S. Bureau of Labor Statistics. Many positions need to be filled due to retirements, with some of the best job possibilities being at regional airlines, according to the federal agency. Republic Airline opened a new crew and maintenance base July 1 at George Bush Intercontinental Airport in Houston, its first in Texas. Lauren K.E. Isaacs, a college relations consultant for Republic Airline, said having a larger Texas presence could mean a new labor market to fill jobs for pilots, aviation mechanics and other support fields. The airline’s bases are primarily in the Midwest and Northeast. The airline has the RJet Cadet Program for students at federal Part 141 aviation schools who have their instrument rating, a cumulative 3.0 GPA, no more than two checkride failures and are authorized to work in the United States. The airline also has the RJet Ambassadors Program for college students to be part-time employees to represent the company on campus. Thomas Schroeder, 21, of Conroe is a TSTC Aircraft Pilot Training Technology major who became an RJet Ambassador in January. He said he was glad airline staff made the trip to Waco. “It shows they have a vested interest in the future of the industry,” Schroeder said. 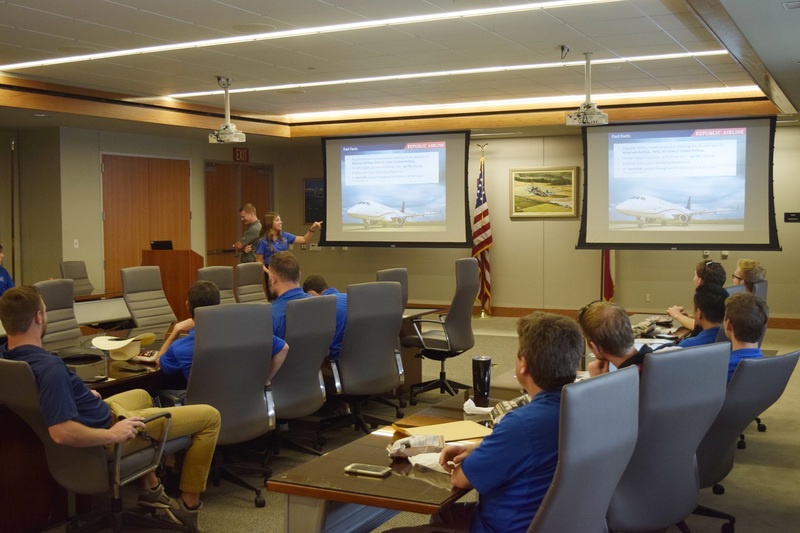 The airline offers summer internships for students interested in communications, engineering, flight operations, graphic design, supply chain management and other fields. Selected interns work in Indianapolis, Isaacs said. Parker Allan, 24, of Martindale is a TSTC Aircraft Pilot Training Technology and Aircraft Dispatch Technology major scheduled to graduate in 2020. He wants to stay in Texas to work after graduation. Allan said he enjoyed hearing details of the pilot’s life in selecting the best place to live and working with flight schedules. He said the information gave him a good start thinking about his future as a pilot. “It was eye-opening,” Allan said. Republic Airline was known as Chautauqua Airlines when the first flight was made on Aug. 1, 1974, from Jamestown, New York. Today, the airline has about 5,500 employees and partners with American Airlines, Delta Airlines and United Airlines. The airline has a fleet of more than 190 Embraer 170/175s. For more information on Republic Airline, go to rjet.com. This entry was posted in Waco on July 13, 2018 by Daniel Perry.